Strava details can be found here. The circuit is a dog leg shape with a sweepeing corner at the north and a very tight ( and tightening) corner that comes back on its self slightly, to the south. Its a drag heading north and then fast down towards the tight southerly corner. Every now and then people try and make up places by diving down the inside of the tight hairpin *tut tut, and then everyone sprints out…. and repeat. As when reporting any race, I open with a barrage of excuses that range from a bike mechanical to a dodgy Banana I consumed on a training ride last week. This time my excuses are: The tail end of a cold, stress with job interviews (stress is always a good one) and “heavy legs” after just returning from holiday. Unfortunately I don’t have much to report owing to my mediocre performance. For me the race can be divided into three distinct parts. 1) Attacks: Early on I was going a few small attacks with the hope of being out front and getting swept up if and when a major break goes. I felt quite good at this point… but, typically I was just expending energy beyond my endurance abilities. What eventually happened was not so much a break as a split which went in chase of 3 (ish) guys that had a gap. Stupidly I was too cooked to go with this which leads me on to part two. 2) The chase: So now relegated to the back-end of the race I was conflicted as to whether to sit in, chase or bridge. So I did what any great tactician does…. all three, rendering each chosen tactic feeble and ineffective. I put in a few turns, resting between, and put in a few digs only to get closed down. There was were two hopeful points in the race at which there was a glimmer of return to the front group. The first, was when the gap reduced dramatically and I thought to myself “just recover a little longer, then bridge” by the next corner they had tripled the gap, probably thinking “we wont let them recovery and then bridge the gap”… so that was obviously a bad move and should instantly. The second perceived opportunity was when two guys were hovering in between us (at the back) and the larger front group (who were chasing a smaller break). I bridged across and began to recover with the mind of attacking again and bridging to the front group…. within seconds we were back in the group… eugh. 3) Resignation: After trying everything I could to save my race I just sat in the bunch and waited for the finish. This was probably the most painful part of the race, as I was just riding to finish. All in all a bit of a downer of a race report. strength = no good enough, Tactics = poor. The clocks have changed now so the calendar starts to fill out with races… I hope to have a more positive report soon. I’ll be having a go at my first time trials over the next couple of weeks….potentially against the recommendation of the UCI (see here). My racing has stopped for a bit now and I will have a rest week this week in order to fully recovery before my next phase. From here until the end of April the focus is nearly on above threshold work. with hard intervals of sub 10 minutes duration. I plan on breaking sessions down based on time intervals. I really want to work on my sprint, which is something I will try and build throughout the whole season. I will try for three hard sessions a week, making sure my recovery days in between are real recovery days. I will also carry on periodising my riding with one easy/rest week every 3 weeks. The weather is still terrible here…. I am seriously looking forward to some spring time weather. I did not want to get out on the road bike this weekend due to the snow and rain, so I headed out Cannock Chase for some “mountain” biking. This was an absolute mud bath, but great fun and I absolutely smashed myself. My bike and bike handling skills need some TLC, and I dropped the poor bike a few times. 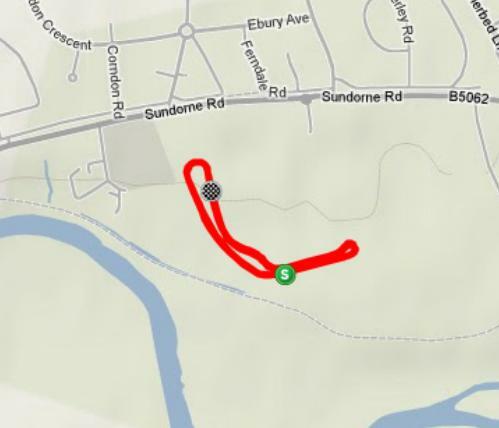 Strava data (Muddy Cannock attack) for the ride is here. I haven’t had the opportunity to go mountain biking in a while, but I will definitely be doing a lot more from now on…. The dump of snow across the UK this week has stopped me getting out on the road bike. Birmingham was covered all week, with ‘flurries’ of snow everyday. So, apart from the trainer the only real riding I have been doing is my very short commute to and from University. Although short, my route through the park is quite tough when ploughing through the snow. I stopped for a light pollution illuminated picture on the way home one night. 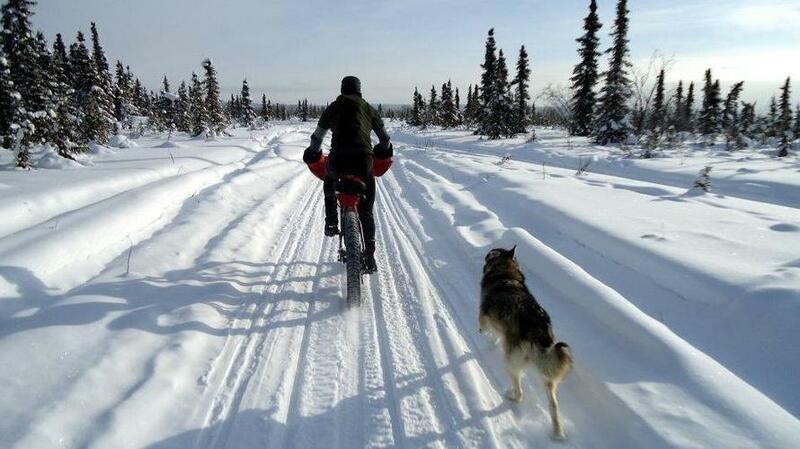 I thought it was difficult to ride around in the snow, but a guy from Alaska has got it down, with a modified snow bike. 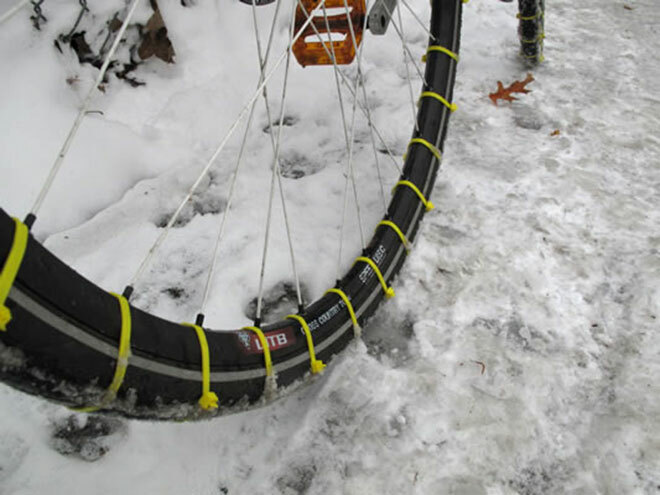 The link to the to the article is here: Pimped out snow bike. I also liked this money saving snow solution…. I decided to head South this weekend to the warmth of outer London. Kind of like a training camp, but very short, without the good weather and with no professional cyclists. But I will be racing at the Hillingdon winter series.